This witty, engaging homage to cult alien invasion films – from half of Channel 4’s The Adam & Joe Show alternative comedy team – trades on parachuting malevolent extraterrestrials into a South London council estate on Guy Fawkes Night. The ferocious “gorilla-wolf motherfuckers”, however, bite off more than they can chew when confronting a posse of young teenagers armed with adapted fireworks and waterpistols as well as heavier weaponry. Mobilising intimate territorial smarts honed in running rings around parents, police and drug dealers, the youngsters win the day supported by peers and sundry outsiders straying into the parish, and Attack the Block works thanks to intensive local research and an impressive street-cast ensemble – who adapt and enrich the dialogue and knockabout farce within the constraints of a somewhat strained, knowingly cheesy narrative which never, thankfully, drowns out their exuberance. The pitch would now struggle for funding, with the demonisation of organised feral youth as national nemesis reflected in the opening mugging scene – but here they represent a primary line of defence, showing the ingenuity, determination, and collective coordination needed to protect the community. But against what? It transpires that the otherworldly adversaries only targeted this block after the murderous response to their random arrival there. Unknowingly, thanks to the unfortunate conditions leading to them to live as they do, the gang brought it on themselves – undermining perceptions of injustice about inevitable blame for all ills afflicting their milieu, and legitimising paramilitary punishment by the authorities despite redemption as folk-heroes for successfully exorcising their demons. This conceptual straitjacket explains why the alien onslaught cannot be linked to real external forces impacting on poor areas – except to ridicule such possibilities, like when Moses muses about being flooded with drugs, guns, police, and now aliens because “we’re not killing each other quickly enough”. Sympathy for the little devils only goes so far, it seems. Worse, although the ethnically diverse gang members inhabit varying multicultural experiences and circumstances, the monsters returning from the repressed are explicitly designated as extreme ‘blackness’ – motivated, moreover, purely by instinctual reproductive drives. This metaphorical manoeuvre revives ancient imperial hatreds lurking behind liberal commitment to ‘humanising hoodies’, rhetorically reinforced by the presence of empty signifiers of the more-or-less respectable upper and lower middle-classes to encourage identification among cluelessly comfortable audiences – which can be simultaneously disavowed by deploying superior subcultural capital. But the otherwise superfluous mugging victim and toff stoner become pivotal to the plot, respectively teaching the kids mutual dependence and the need for ‘scientific’ knowledge to anchor effective tactics (which there’s no earthly reason they couldn’t figure out for themselves). Amidst this ‘all in it together’ patronisation, the chances for deeper meaningful connections to be made between contemporary class stratification and the predicaments which dominate impoverished urban existence are obliterated in Ali G-style comic relief, scoffing at stereotypically clichéd tentative self-criticisms which are never followed up. Strictly segregating which and whose understandings have import and practical significance rather than entertainment value, Attack the Block thus has far more in common with the safe conservatism of Spielbergian spectacle – with pretensions to the generic subversions of pulp science fiction and horror cinema little more than skin deep. 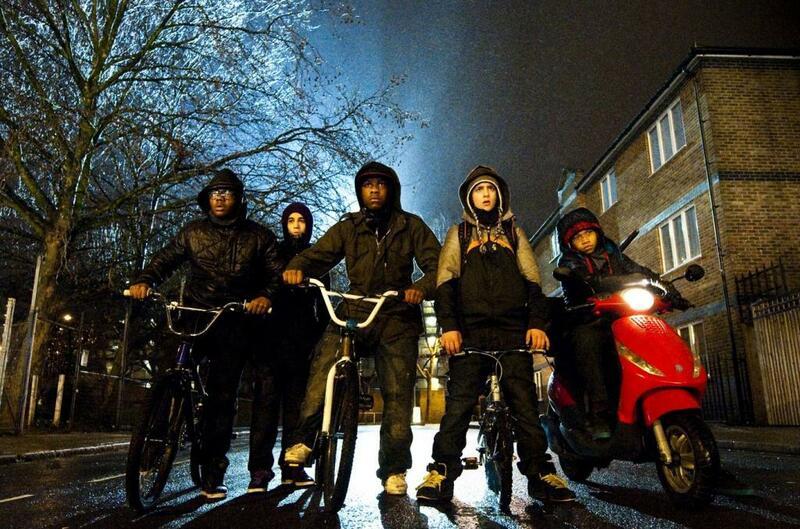 Attack the Block is available now on DVD. Review first published in Freedom, Vol. 72, No. 18, November 2011. In a clungy way I thought the film was pushing 'the community' envelope. This particularly resonated with the finale which was shoe-horned in a sort of 'boy done good' theme to correct the protagonists early wayward trajectory. Totally liberal, I know. And along the way the mugging victim/nurse just feed into this, because they had to be seen to co-operate to get the feel good ending. when Moses muses about being flooded with drugs, guns, police, and now aliens because “we’re not killing each other quickly enough”. Sympathy for the little devils only goes so far, it seems. I thought when this reared its head in the dialogue it was funny, because it was at odds with the subplot concerning the black gangster, who was clearly the films antagonist and was the films way of exposing the futile view of black victimhood. Worse, although the ethnically diverse gang members inhabit varying multicultural experiences and circumstances, the monsters returning from the repressed are explicitly designated as extreme ‘blackness’ – motivated, moreover, purely by instinctual reproductive drives. This metaphorical manoeuvre revives ancient imperial hatreds lurking behind liberal commitment to ‘humanising hoodies’, rhetorically reinforced by the presence of empty signifiers of the more-or-less respectable upper and lower middle-classes to encourage identification among cluelessly comfortable audiences – which can be simultaneously disavowed by deploying superior subcultural capital. man, really? i think i've seen totally different movie. the film was fine. however, the political aspects were rather forced and if the author(s) meant to give politics that should be understood the way the quote suggests, it totally didn't work (for me). Also, all of these plot elements help the film to convince by referencing both 60s/70s US blaxploitation and the new wave from Spike Lee and Boyz N The Hood onwards. The reason I over-emphasised the racist logic of this film is that its storyline does absolutely nothing interesting with the possibilities raised - except retreat to the liberal confort zone. Yeah, MT, well, I’d never pretend there’s only one ‘true’ or ‘correct’ interpretation. I agree the politics were “rather forced”, but I also explained why I thought that had to be the case given the way they set up the story. Who cares what the filmmakers intended? I daresay they were quite pleased with themselves for ‘doing an ET’ and relating the concept of aliens to the characters’ internal psychology. Some viewers may limit themselves to being impressed by that, as part of the entertainment value, so that whatever else might be going on doesn’t get noticed (although may still have an effect ...). That’s why I try to tease out the stuff that never gets mentioned anywhere else in mainstream commentary. thanks for explanation, now understand your point. the theme had a huge potential, but it was unused and all i remember from the film now is those creatures and some niggas speaking english english and running around (in) the hood? but it entertained me, hehe.